Just a half a block from the spot where a Baltimore police officer repeatedly punched her son in the face and head earlier this month, Shonta McGrier stood quietly last night. 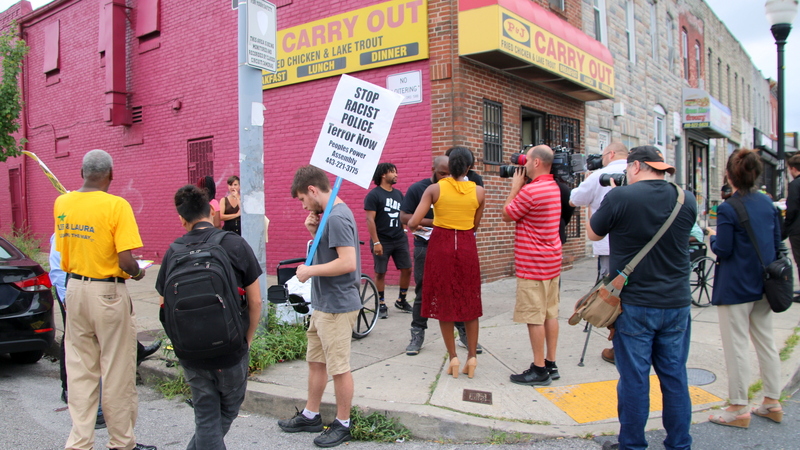 She was with a crowd of activists and neighbors gathered to protest the beating of 26-year-old Dashawn McGrier, shown on a bystander’s cellphone video not fighting back as Officer Arthur Williams punches him, shoves him down onto rowhouse steps and eventually the sidewalk, where his face is pressed down in a pool of his blood. Shonta McGrier didn’t talk to reporters, but when speakers addressed the crowd, she nodded assent and applauded heartily. 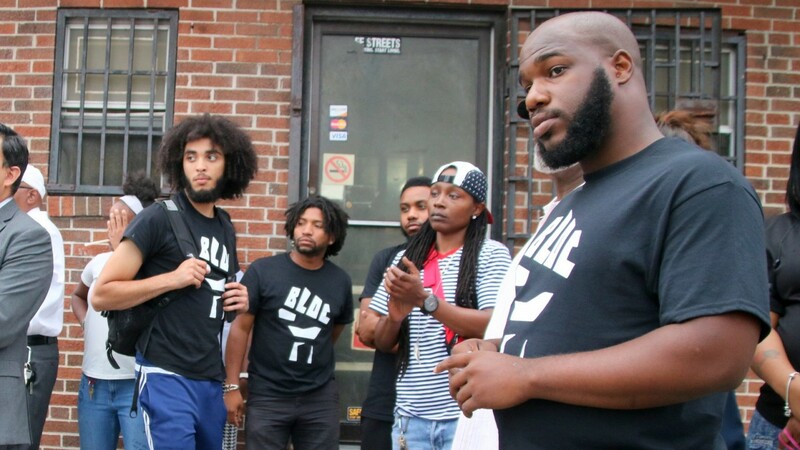 “The Baltimore Police Department is corrupt,”said Tre Murphy of Black Leaders Organizing for Change, the group that led the protest at the corner of Monument Street and Luzerne Avenue. “It is, most of the time, one big violent gang that wants to assert its authority, and as a result people end up getting hurt,” he said. After the viral video sparked outrage in Baltimore and beyond, Williams was allowed to resign from the force and was then charged with assault and released on bail. 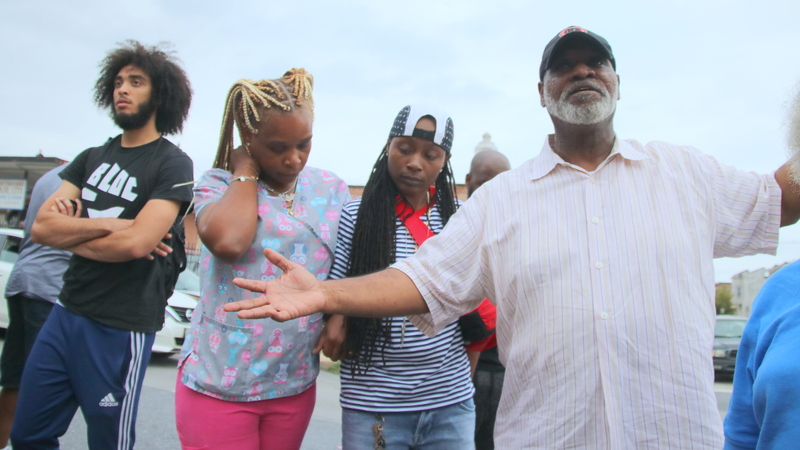 Mayor Catherine Pugh and Interim Police Commissioner Gary Tuggle called the video disturbing, but Murphy and his group said more must be done. • Remove the Civilian Review Board (CRB) from the City Solicitor’s Office to avoid the conflict of interest – that the office represents the Baltimore City Police Department (BPD). • Strengthen the CRB, incorporating suggestions from the Community Oversight Task Force created by the U.S. Department of Justice, recommending a fully independent oversight body with investigatory powers and an adequate budget tied to the BPD’s budget. • BPD must cooperate, as required by law, with the Civilian Review Board and make appropriate Internal Affair records available to CRB investigators and board members. • A commitments from City Hall to support LEOBR and MPIA reform to ensure police accountability, civilian oversight and the mandate of the DOJ’s consent decree. • A clear outline from BPD of its efforts over the next six months to improve community relations. • Clarity on what training regarding de-escalation, community policing and racial equity police officers on patrol are receiving, and metrics on how effective the implementation is. In the letter, leaders of Black Leaders Organizing for Change call on Pugh to respond publicly by the end of the week. “We cannot afford BPD another victim due to recklessness and lack of accountability,” they wrote. Williams, hired by the BPD last year, has pleaded not guilty to the first- and second-degree assault and other charges he faces. He was released from custody and is scheduled for trial in October. Along the stretch of Monument street residents refer to as “down the hill,” the protest drew a crowd of onlookers. Shaude Thompson said what happened to McGrier was wrong, as was the judicial system’s subsequent handling of the August 11 incident. Thompson said relations with police in the neighborhood are not good, citing a recent incident involving children selling bottled water and juice on the street. “I mean, they were kids. They weren’t breaking the law or robbing anybody. They were just trying to earn some money, and the cops came and shut ’em down,” she said.